PROPOSAL: Firefighting needs are cited, reducing the land included near Big Bear Valley. Sen. Barbara Boxer reintroduced a bill Friday that would designate 2.5 million acres in California as wilderness. A similar bill stalled last year in committee. Most of the wilderness areas suggested in the bill are the same as in last year's version. However, proposed wilderness around Sugarloaf Mountain, southeast of Big Bear Lake, was reduced from 8,320 acres to 6,336 acres because of local concerns over how the designation might hamper firefighting, David Sandretti, a spokesman for Boxer, D-Calif, said by telephone from Washington, D. C.
The bill was amended so the wilderness area would no longer extend into the residential Big Bear Valley. The wilderness still would encompass territory from the mountain ridgeline south toward Highway 38. The forest, tinder dry from drought and bark beetle damage, could be the site of a catastrophic fire, officials are predicting. The 1964 Wilderness Act bans any mechanized equipment, meaning that off-roading and mountain biking are banned in such areas. Sandretti said that firefighting machinery has emergency exemptions, but one local fire official said it's not always that easy. "We can't just plow in with bulldozers There's permission to be gained," Bill Peters, California Department of Forestry spokesman, said. "I've seen areas where we couldn't use chainsaws, can't pump water, can't use bulldozers. It's questionable whether you can even do air drops," Peters said in a telephone interview. 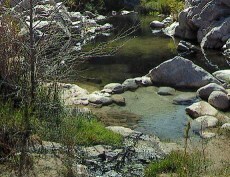 If passed as is, the California Wild Heritage Wilderness Act of 2003 would cover about 440,000 acres in Riverside and San Bernardino counties. That includes land in Joshua Tree National Park and around San Gorgonio and Cahuilla mountains in the San Bernardino National Forest. In addition, a wilderness area of 8,320 acres would be created around the south fork of the San Jacinto River, above Hemet; and a wild-and-scenic-river designation would mark a 20-mile stretch of Deep Creek east of Lake Arrowhead.